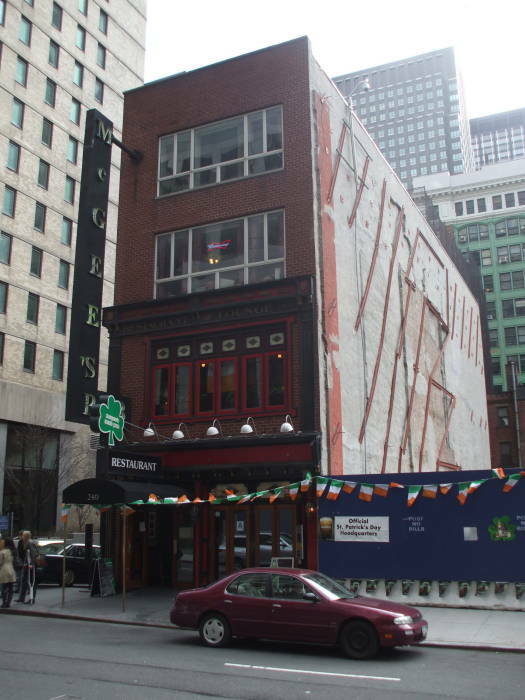 McGee's Pub, the model for MacLaren's Bar in "How I Met Your Mother"
Where is MacLaren's Bar in "How I Met Your Mother"? 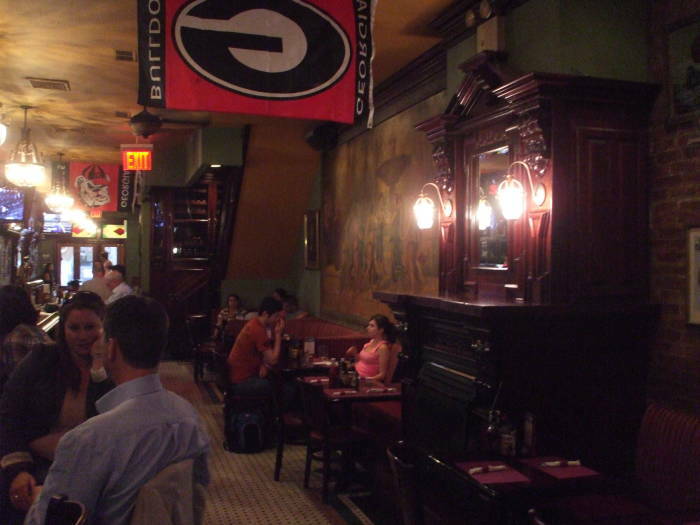 How I Met Your Mother was set in a variety of locations in New York, including the semi-fictitious MacLaren's bar. The few addresses mentioned on the show indicated an Upper West Side location, while the exterior sets look more like the East Village or maybe Greenwich Village. However, the real bar where the show's creators hung out and based their show is just a few blocks north of Times Square in Midtown Manhattan. Here's how to find the real bar that MacLaren's was based on, how to visit it, and what you will find there. The series was created by Craig Thomas and Carter Bays, who said "Let's write about our friends and the stupid stuff we did in New York." 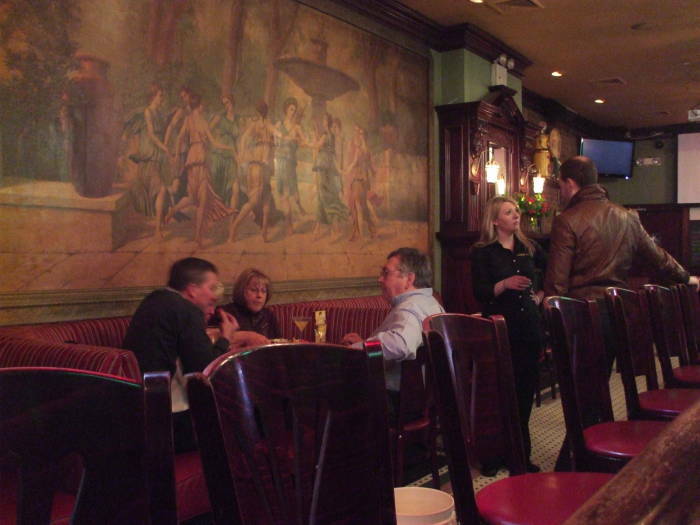 Many scenes are set in MacLaren's, a small bar a half-floor below street level, in the same building below the apartment of some of the main characters. Carter Bays' assistant in real life is Carl MacLaren. The show features a MacLaren's bar with a bartender named Carl. 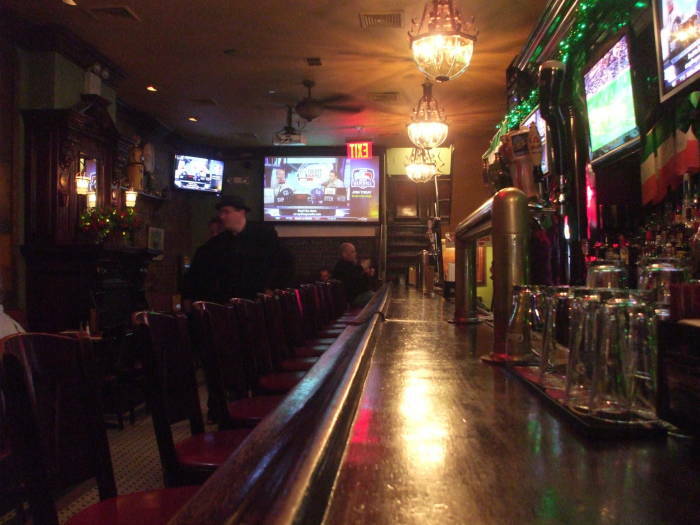 MacLaren's is based on McGee's, a relatively much larger bar in Manhattan. 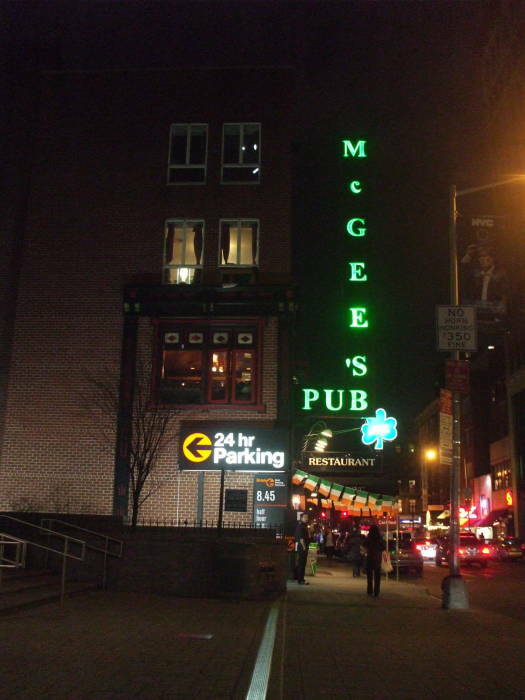 McGee's is at 240 West 55th Street, between Broadway and 8th Avenue in Midtown Manhattan. Or, in New York nomenclature, 240 W 55th btwn Bway & 8th. Exterior of McGee's pub, 240 W 55th, between Broadway & 8th Avenue, the model for McLaren's bar in How I Met Your Mother. McGee's exterior at night, looking west on 55th. This is the opposite of the usual space situations in television shows. Characters' apartments are usually enormous, much larger than actual New York apartments! Here is an unusual case where the television setting is much smaller than the real location on which it is based. The lot from the west wall of McGee's to 8th Avenue, and all the way from 55th to 54th, had been torn down for new construction when I took the first of these pictures in March, 2011. The picture here shows some bracing added to the west wall of McGee's and the blue fencing around the construction site. A little over a year later, the new tower loomed many stories over McGee's. Here we see McGee's exterior at night. We're looking west on 55th toward Eighth Avenue. You get into the Hell's Kitchen district as you near Eighth Avenue. McGee's bars and restaurants are on the ground floor and second floor, running most of the way from the front to rear of the building. The third floor holds a large room that can be rented for special events: that's the pair of narrow windows seen here as mostly white. The fourth and top floor may be an apartment. I read somewhere that the show's creators supposedly lived above this bar while coming up with the premise for the show, just as their characters live above the analogous bar. If true, that would contradict the image of the starving artists — that would be a very large apartment in a nice building just off Broadway in Midtown Manhattan! McGee's is just off Broadway and just a block and a half north from the Ed Sullivan Theatre, where both Thomas and Bays wrote for David Letterman's show. Below we see a view down the bar on the ground floor. It's quiet, early afternoon on a Monday. 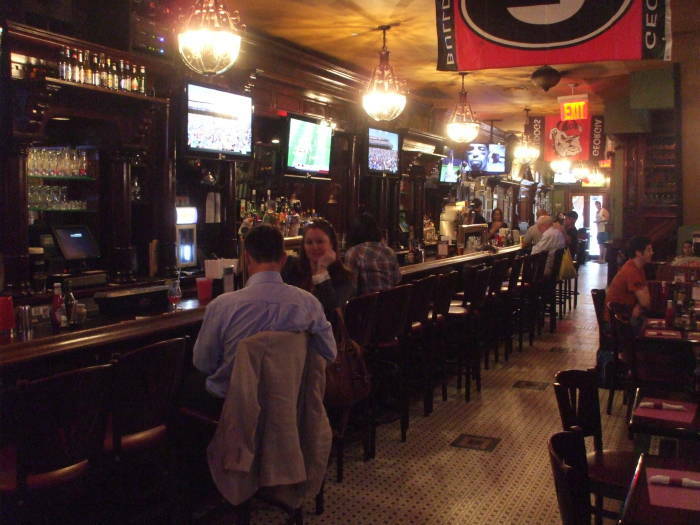 McGee's is a pretty typical Midtown bar. It has a full bar on each level with several beer taps, a full menu, and some claim of Irish affiliation. Of course, in late March as it was when I took these pictures, every New York bar will have St Patrick's Day debris. Bays and Thomas especially liked a large mural in the main floor in McGees, and they wanted to incorporate it into the show. They did, but it's rather subtle (unless there's some episode where it plays a much more prominent role than in the ones I've seen). First-floor bar in McGee's pub, the model for McLaren's bar in How I Met Your Mother. The mural in the first floor of McGee's. Still from the show set: the five main characters at their usual table. Most of the shots set in the bar show the main characters at their usual table, as seen here. You get the impression that the near end of the table is against an invisible wall which we are looking through. The main entrance is to the right of the windows seen on the far side of the room. The bar itself it out of sight to our right, and some other booths are along a wall to our left, not visible in this typical view. A version of the mural is infrequently seen on that wall to our left, but it's not a common part of the show. The pictures above and below let you compare what you see on the show to the original mural, the reason for basing MacLaren's on McGees. It's on the ground floor, on the wall opposite the bar. So, in a way, it is placed as it infrequently appears on the show. The view from the very back of the front room of McGee's. The exterior shots on How I Met Your Mother seem much more like Greenwich Village or parts of the East Village. It's the studio's "New York back lot". Narrower streets, short blocks, and not the rectangular "Manhattan grid" of Midtown. The depiction of MacLaren's on the show reminds me much more of an East Village bar like McSorley's Old Ale House at 15 East 7th, or a Greenwich Village pub like the Four-Faced Liar at 165 West 4th (between 6th & 7th Avenues). They are much more the size and atmosphere depicted on the show. 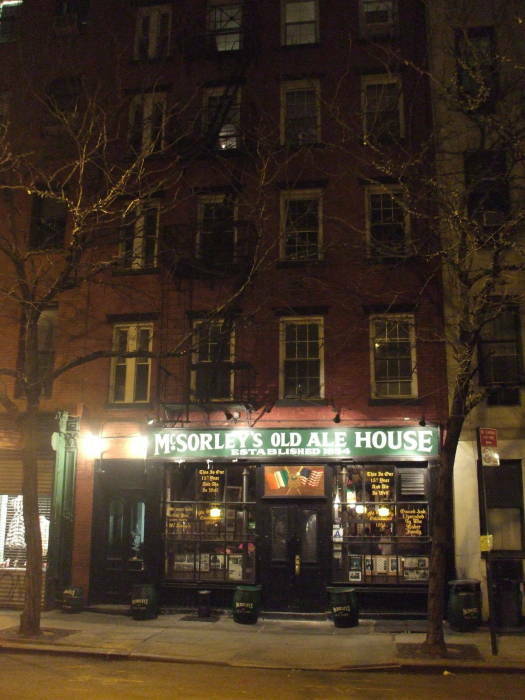 McSorley's Old Ale House on East 7th Street in the East Village. A New Yorker profile of sitcom creator Chuck Lorre discussed how most situation comedies have been done as "three-camera" productions. As that article describes it, they're almost like a play that is filmed (video recorded) from multiple simultaneous camera viewpoints, often with an audience. The resulting video streams and audio track are edited into a final product. How I Met Your Mother is one of an increasing trend of "single camera" production, which is much more like the production of a movie. They take about three days to record a typical episode, each with 50 or more scenes and rapid transitions. The entire premise of How I Met Your Mother is that it's a narrative in the past tense. The framing device is that its main character is telling his children in the year 2030 about how he met his mother some time in the 2010s. Then, within that past-tense narrative, the characters often tell each other a story about how something happened. All of the characters are unreliable narrators, at times accidentally and at other times intentionally, meaning that a character's narration in our present (twenty years or more in the past for the ultimate narrator's children) may be immediately corrected by another character. Within the show we then see two or more contradicting versions of the same flashback. If you think that's confusing, try figuring out the 1944 Humphrey Bogart movie "Passage to Marseille". That entire movie is a flashback, inside a narrative flashback, inside a narrative frame. Co-creator Craig Thomas said that it would be impossible to shoot the series in front of a live audience as it would "blur the line between 'audience' and 'hostage situation'." Related to the movie-like production, How I Met Your Mother has won a number of Emmy awards: Outstanding Art Direction for a Multi-Camera Series (2006, 2007, 2008, 2009) and Outstanding Cinematography for a Multi-Camera Series (2006), and it was nominated for Outstanding Multi-Camera Picture Editing for a Series (2007, 2009).